Calibre 528 - gold plated metal. Fine, very rare and eye-catcher Jaeger-LeCoultre Atmos COLANI, the model in gold plated metal casing, reference 5921. 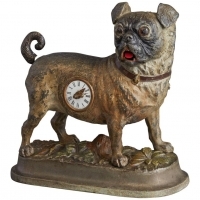 Only manufactured from 1974 - 1975, the clock is very rare and reflects the style of the 70s in very beautiful manner. 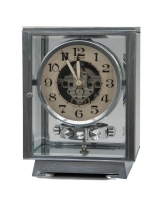 Squared dial with squared application, rectangular indices, the front of the casing is round and opening to the top. Lovely dimensions: 250 mm x 195 mm x 130 mm.